In the days of the Old Ryukyu Kingdom, Okinawans developed an early road system to help them travel from one end of the island to the other. One major road was called Sukumichi which had passed through the village of Kin (present-day Kin Town). The route closed in at a very narrow portion of a major river within the village. This location was called ukukubi, an Okinawan word meaning 'the neck towards the back'. In this case, it is referring to the river's neck up the stream (the narrowest part of the river). The present term for ukukubi is okukubi (奥首), which is the Japanese pronunciation. 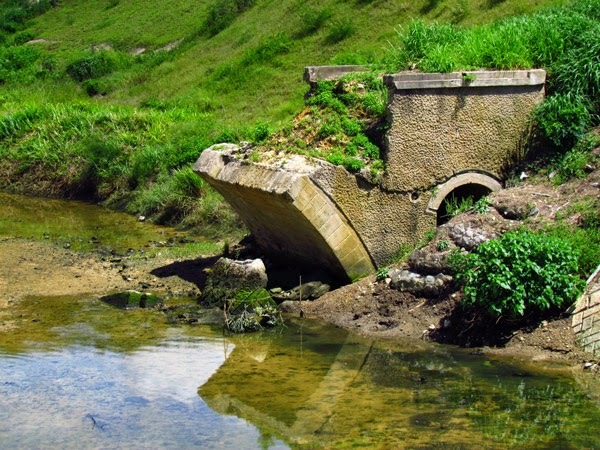 It was in 1931 at this narrow channel that an arch-shaped bridge constructed of concrete was erected to aid travelers crossing the river. However, the bridge was later demolished by a Japanese garrison before the US invasion took place during the battle of Okinawa. The bridge became known as the Okukubi-bashi, (bashi - a term meaning bridge). An image of the bridge intact can be seen on location on a historical sign (see image here). 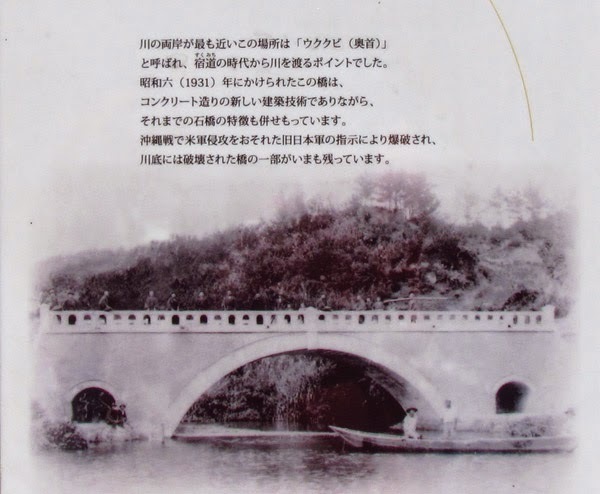 Intriguingly, the major river that flowed underneath this bridge became known as the Okukubi River, however the current kanji representation for the river's name (億首川) leads to a different story of how the river's name came to life. See the Legend of the Okukubi River. Directions/Parking/Amenities. Take Highway 329 till you reach the south end of the Kin Bridge (see Blue Route on map). Turn towards the direction of the dam. You will travel down a hill and see the Kin Dam shortly after (it will be on your left). Near the bottom of the hill you will see small parking area with a toilet facility. 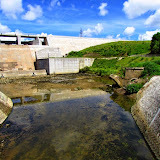 The Okukubi Bridge ruin is about a 75 meters in front of the dam spillway.